Our 2012 Seven Days of Prayer and Fasting is in full swing! Check out these testimonies from people who have been seeking God to bring breakthrough in different areas of their lives. We hope you are encouraged as we are! One of my faith goals in 2011 was healing for my mother-in-law. She was diagnosed to have stage four lymphoma. Because of God’s healing power, she was healed and is now cancer free. Praise God for this! I have been childless for six years. I joined our Prayer and Fasting in 2009 and asked God for a baby. I got pregnant after that. Last year, I joined again and got pregnant with my second child. God really opened my womb. What an amazing God! My husband and I have joined the annual Prayer and Fasting since 2009. God never fails to do more than we ask for! When our child was three months old, he was diagnosed with pulmonary tuberculosis and God healed him! Truly, God is FAITHFUL! Cage Liongson of Victory Fort Bonifacio narrates the story of how their youngest son was cured of an illness that would have resulted to mental retardation and required lifelong treatment. Watch the full video here. In 2011, I prayed and fasted for family salvation. Three months later, my wife started attending Victory and accepted Christ. 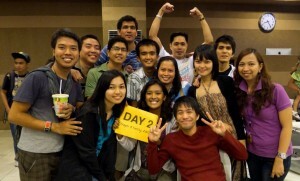 We both finished Victory Weekend that year and have been attending small group meetings regularly. Both my kids are also attending KIDS Church. At may extra pa: my sisters-in-law have been attending service since the early part of 2011. Amazing how God answers prayer. I’ve been praying for the salvation of my family for years now and I always include that in my Prayer and Fasting faith goals. God answered my prayers in 2011, when my mother and younger sister accepted Jesus as their Lord and Savior. I’ve been working in a government agency for five months now. This year, I prayed for a promotion and increase in salary. To my surprise, our boss talked to me (during Day Four of Prayer and Fasting), giving me good news. As I renew my contract (this year), I’ll be assuming a new post, and the salary is almost tripled compared to what I’m receiving. I’ve been working in my present company for more than five years and still haven’t received a salary increase. I made that as one of my faith goals in 2011. God faithfully answered my request. Despite the company crisis, retrenchment, and cost cutting, God provided for me. He is so awesome! Praise God for the wonderful breakthrough! I fasted for my acceptance to the AUSAID scholarship grant. Now I just finished my first semester at the University of Sydney and am looking forward to the start of school year 2012! (I also fasted) to win in the Toastmasters (International Speech) Contest all the way to the National Finals. Not only did I (win) in the Philippines, but I also won in three speech contests in Australia! My husband and I separated two months after I gave birth to our third child. It was the most painful trial ever. But God is amazing. He brought us back together after eight months. During our first talk, my husband said that he missed God so much and wanted to repent and go back to Him. My brother and I were not in good terms in 2010. During the 2011 Prayer and Fasting, my sister and I fasted for a reconciliation with my brother. And God is really good. Now, my brother and I are in good terms and he became more responsible as a brother and a son. Peachy and Elmer of Victory Fort Bonifacio tell the story of how they found God in the midst of a serious marital problem that was threatening their family. Watch the full video here. These are just some of what God has been doing mightily! If you’d like to share your testimony with us, please email stories@victory.org.ph. Let’s continue believing that God will do great things in our lives this year! What was the toughest Lordship decision you've ever had to make? Last year, my husband and I fasted specifically for the salvation of our teachers and friends. All of them accepted Christ within the year and the 2nd to the last one, accepted the Lord yesterday, during his birthday, the first time ever that he went to Victory Ortigas with us. What a special way to answer a prayer! Praise you Lord! Thanks for sharing your testimony, Jen! God is awesome! My family has been praying for financial breakthrough so we can support a friend going out for a long term missions next month. To our surprise, a hospital called my husband on the 2nd day of prayer and fasting (Jan 7, 2012) asking for an appointment for they are planning to purchase the product that we are offering. The deal was closed on the 5th day of our prayer and fasting and we received their payment the day after. God is great indeed! God surely provides—more than we ever ask for or imagine! Thanks for sharing your testimony, NSM! Please i need a prayer of forgiveness Almost 5 years ago, i “gave my life” to Christ to please my boyfriend and so that he would accept me.However, it backfired, The devil lied to me i know now.Now i have a desire for Christ, i ask for joint prayers from you as i embark on this journey. It was not worth it. Please aon this journey. am soooooo sorry to God soo very much. Should God feel that its for his own good let it be on his own term. please pray with me am so sorry to God am so so so so so Sorry. please pray with me. am really sorry to God.